Sterling, VA and Germantown, WI (October 10, 2008) . . . Gammaflux LP and MGS Mfg. Group, Inc. have announced that they have reached an agreement whereby MGS will offer Gammaflux hot runner temperature control on all of its Universal Multishot Systems portable injection units. MGS, an industry leader in multishot tooling and molding, has been manufacturing multishot (multiple-material) molds since the 1980s. Today, the company provides customers with complete multishot molding cells and also offers multishot molding services through its TecStar custom molding division. TecStar has over 50 multishot systems running on machines ranging from 28 - 880 tons. The company has worked with Gammaflux to develop hot runner control solutions specifically designed for these types of systems, according to John Hahn, Vice President of Engineering at MGS. "Gammaflux has worked with us to integrate their hot runner control into our multishot molding system," he said. "Their control and screen is integrated into the MGS screen, so all of the Gammaflux features are accessible to operators at the touch of a button." Benefits for the customer include a single control screen for all machine and hot runner control functions, said Hahn. Integration of the hot runner control also saves valuable floor space on the plant floor. "We are happy to announce this agreement with MGS, who is one of the leading multishot molding companies in the world," said Vince Leone, Gammaflux Vice President. "Their molding systems help customers gain a competitive edge, which is enhanced with the addition of integrated Gammaflux temperature control." MGS and its multishot customers are producing hundreds of multi-material products on MGS systems, according to Hahn. These include everything from personal care items such as toothbrushes and razors to medical devices, closures, hand tools, and automotive tail-light lenses. "Business is good for us in this area," he said. "Many molders are looking for better ways to compete in a tough economy, and multishot molding is a good way to do it." Gammaflux offers a 5-Year Warranty on all of its hot runner temperature control systems. This warranty is believed to be the longest such warranty in the industry. It covers all of the company's LEC and TTC temperature control products. Headquartered in Germantown, Wisconsin, USA, MGS Mfg. Group is an engineered solutions provider of design, tooling, molding, and specialty equipment to the plastics industry. 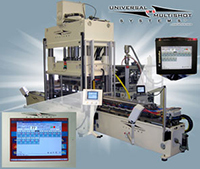 MGS tooling systems and turn key manufacturing cells are in operation around the world serving customers in the medical, electronics, packaging, automotive, computer, and consumer products industries.